Step 1 - Log into your Self Service Account and view the "Book Field / Cage Time" page to see which sessions are available. After logging into your account, click on the "Book Field / Cage Time" button on the left hand side of the page. Step 2 - Click on the session that you wish to reserve. Find a Field or Cage time on the schedule that works for your schedule. Click on the schedule you would like to reserve to select it. In order to reserve your selected session, you must first Buy a Package that applies to that session type. In order to do this, select "Buy Package" at the bottom right hand corner of the pop up window for your selected session. After you have clicked "Buy Package," you will be taken to the Package menu. The package you need will automatically be listed on the menu. Click on the "Buy" icon to the right of the package. Step 5 - Specify the number of sessions you wish to purchase. ​If you are purchasing a package for Cage Time, you will have to specify how many sessions you wish to purchase. You can choose any value between 1 and 5 and you will be able to reserve that many sessions on the final schedule. 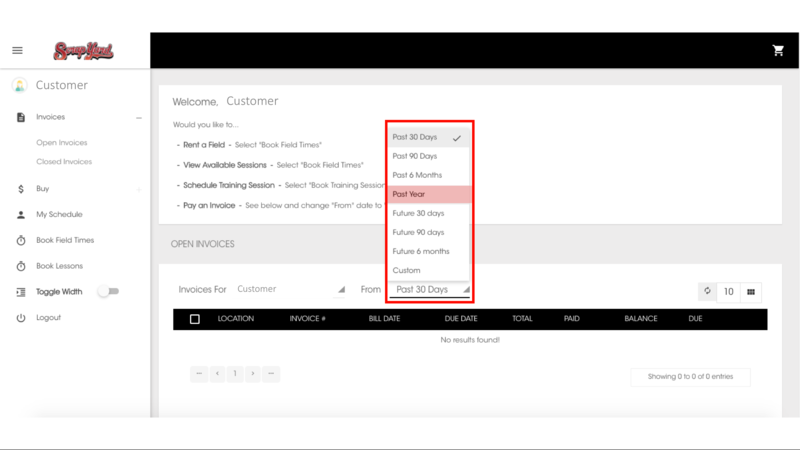 If you are purchasing a package for field time, it will automatically default to 1 session. When you have entered your desired session amount, click "Select"
Step 6 - Complete the Checkout Page. ​Once you have selected your package, you will be taken to the "Checkout" Screen. Complete all of the required information for Payment Method, Billing Address, etc. and then click on "Complete Checkout"
Step 7 - Return to the "Book Field / Cage Time" page and click on your desired session that you just purchased a package for. Once the package has been purchased, you now need to actually schedule your desired session. First, click on the "Book Field / Cage Time" link on the left side of the screen to refresh the schedule. Second, click on your desired session (Iron 2 Cage shown below as an example). Step 8 - Double check the pop up menu that you selected the correct session, then click "Book" at the bottom right of the menu. After clicking on your desired session, a Reservation menu box will appear. Double check that you have the right field name and time slot listed and then click "Book" at the bottom right of the menu. Step 9 - You are confirmed as scheduled for your desired session once you see the great alert bar at the top right that says "Client has been booked into this reservation with a status of Scheduled". Once your scheduled session has been successfully booked, you will see a green alert bar at the top right of the screen. The bar will say "Client has been booked into this reservation with a status of Scheduled"
At this point, you are officially reserved and good to go! 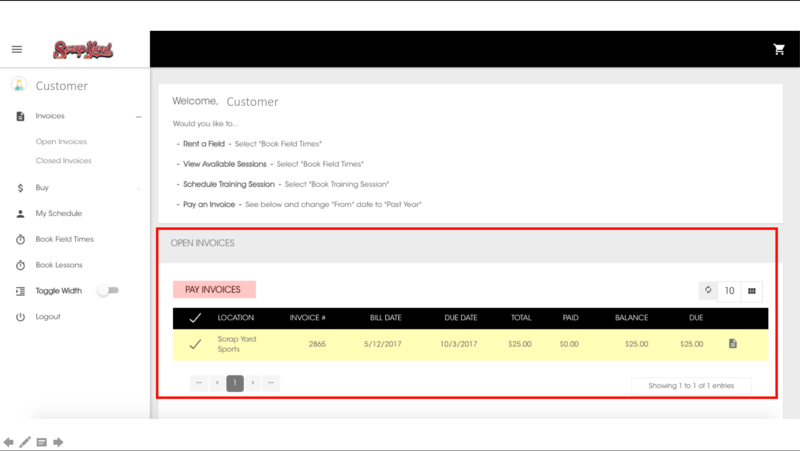 After logging into your account, look on the bottom of the home page for the "Open Invoices" section. 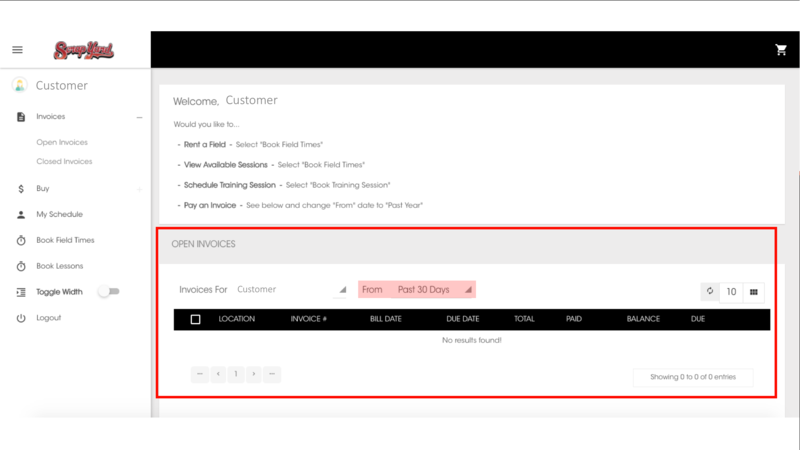 If you don't see the invoice you're looking for, click on the "From" drop down menu that reads "Past 30 Days"
Select "Past Year" from the drop down menu showing "Past 30 Days"
Your invoices for the past year will now show in the list below. Check the box next to the invoice you wish to pay. Click the "Pay Invoices" button at the top of the "Open Invoices" section. Once you have clicked "Pay Invoices," you will be taken to the Invoice Cart menu. You can select to pay either the full balance of the invoice or the current amount due. Once you have made your selection, click on "Check Out" on the far right side of the screen. 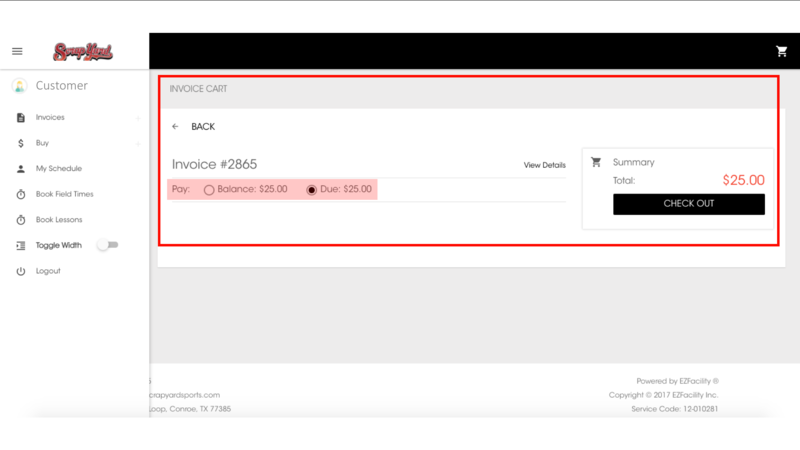 On the "Complete Checkout" page you will be able to view and/or change the Payment Method being used. ​The current credit card on file will show up below the "Payment Method" menu. If you would like to change this credit card, click on "Use New Payment Information" just below the current credit card information listed. 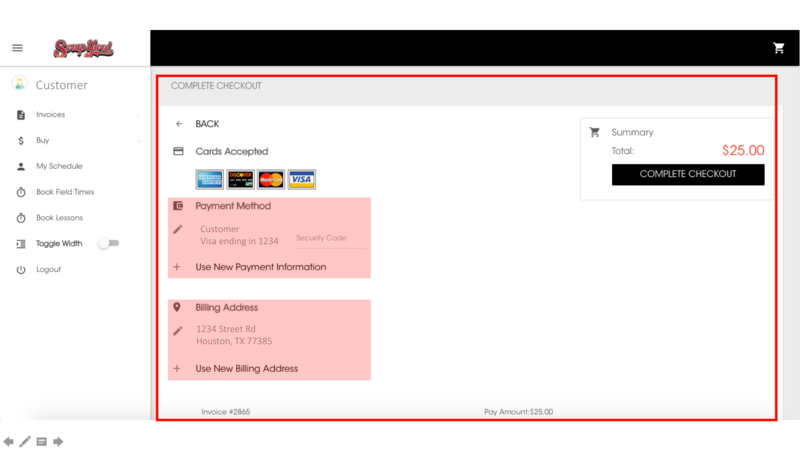 ​Once your payment information and your billing information is updated and accurate, choose the "Complete Checkout" button on the far right.